I started pasting in June of 2009 and marked my 5 year anniversary last month. This month will mark my 27th year on the rez. It amazes me still to see the resonance the project has and the opportunities it’s afforded me to share art and life experiences in this quest to build community. I like to think that I have enough experience now to anticipate the tonal range and acuity of the prints I get from my printer. I thought I’d come up with a bomb proof method for installing work on windy days. But no. The heat was brutal last week. It wasn’t Phoenix hot but 6500 feet on the Colorado Plateau before the monsoon rains start hot. Between the heat, the wind and the print being too dark to be deciphered from the highway some 200 yards away, I failed. But hey, when one door closes, another opens. I’m excited about plan b (not the one the supreme court ruled against this week). And then, a supporter of my work stopped last week to pick my brain a bit. He had questions about my process, about the reception of the work by the community and how that impacts my work at the clinic. Then he asked me the one question I’ve been anticipating and thinking through for the 5 years I’ve been pasting. And when he asked, it was like I’d never considered the question and couldn’t come up with an adequate response. The question was “…How would you say your work differs from JR?” Bam! There it was and there I was, brain dead. I think in not having been asked that question in 5 years I was lulled into thinking the difference between JR’s work and mine was obvious. I guess not. Where is this one? I commute to and from Kayenta and appreciate your other works as I drive that route. hey teresa. thanks for the love. it’s at about milepost 358 on the north side of highway 160. i plan to go over it soon however! Today on my way home from work, I came, I saw, I took a picture of the picture. It’s nice as you get closer. 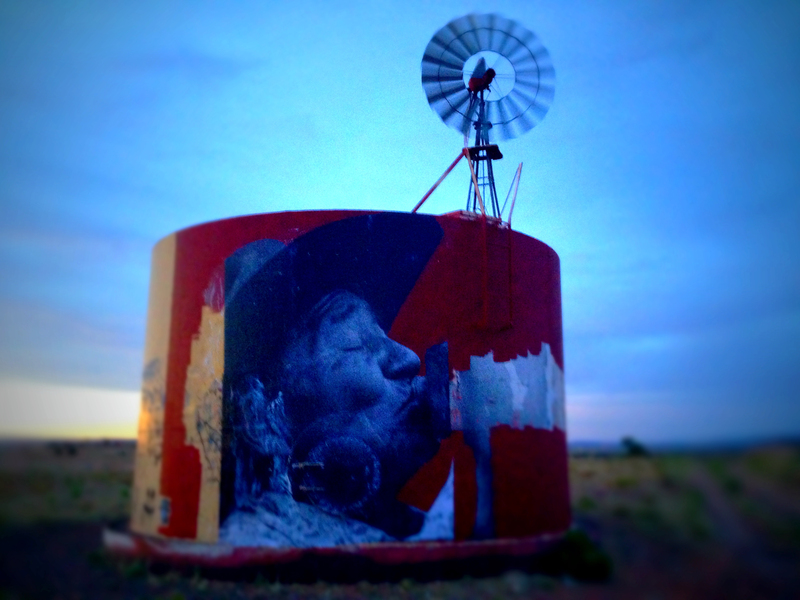 I look forward to seeing the Painted Desert Project’s work this year. PS you can edit this out if you want. I see what you meant about it being a bit dark. I passed it at least 3 times in the past 3 days and got a good look at it only when I got up close. One of my transports to Tuba who is familiar with your pictures also said it was hard to make out. Sorry for such feedback. I would prefer to give glowing reviews. Anyway, I always like seeing (and eating at) the Bluebird cafe and the pink “Lola” as I drive. Peace to you. Greetings. My name is Louise Sheppard. I am a resident here in the remote area of Rocky Ridge. We are under the Hard Rock Chapter, Navajo Nation, Kykotsmovi, Arizona. It is located at the mouth of the People of the Resistant of the Navajo and Hopi Indian Relocation. Anyway, I am a traditional shepherd. We just had our windmill vandalized. Someone came and did writings on it. It is really disgusting and it puts a negative language out there for the people that still resides here. I needing your help to help restoring the OUR WINDMILL. In Navajo we all say shi kiis meaning my friend. We all put a belonging to something and/or someone. You can contact me through email at: shi_ma_sheppard@yahoo.com and/or a phone number 928-613-7622.
thanks for the note. email me at jetsonorama@gmail.com.